Jeff Evans, Regional Sales Manager, Kubota Tractor Corporation with Dan Wallace, U.S. Air Force Veteran and Geared to Give Recipient for the Western Division. Kubota Tractor Corporation has announced five new farmer veteran tractor recipients as part of its 2018 "Geared to Give" program in partnership with the Farmer Veteran Coalition (FVC). This year, for the first time, Kubota is honoring five veterans, adding a fifth veteran to represent its newly-created Midwest operating division. Each veteran will receive the keys to their new Kubota L Series compact tractor in their respective hometown in a special ceremony in recognition of their past U.S. military service and their continued service to their communities through farming. Western Division: Dan Wallace, retired U.S. Air Force veteran who deployed multiple times to Afghanistan in support of Operation Enduring Freedom, is the owner of Drumming Grouse Farm in Kettle Falls, Wa. 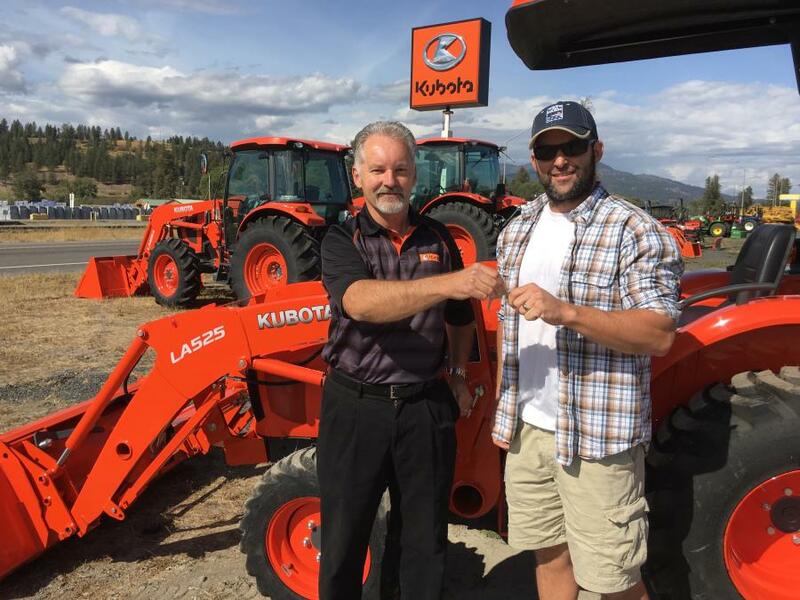 He is happy to replace his 1952 tractor with a new Kubota supported by Kubota dealer LaDuke & Fogle in Colville, Wa. Currently Wallace specializes in growing USDA organically certified seed garlic for local and national sales. As a member of multiple veteran-centric non-profit organizations, his passion is to assist veterans. His vision is to give back to local veterans by offering his farm to provide lessons and services for veterans to learn farming skills. Central Division: Matt McCain is a U.S. Navy veteran who deployed to the Mediterranean Sea in support of two operations. Today, Matt operates a recently acquired 33-acre pick-your-own berry operation called McCain's Family Farm in Ringgold, La. Matt is currently working to get the fields in good condition, planting blueberries, blackberries, apples and pears to expand the farm's offerings. As an experienced engineer, he plans to apply his expertise to replace and repair the farm's drip irrigation and piping system used to fertilize blueberries. His supporting Kubota dealer is Shreveport Tractor in Shreveport, La. Midwest Division: David McArdle, U.S. Navy veteran who served in Iraq and medically retired in 2006, is the owner of McArdle's McArket Garden in Hoffman, Minn. Now in his second year, David is operating a three-acre market garden and micro orchard, growing fruit, trees, flowers, berries and vegetables, as well as laying hens. With plans to add another two acres and a vision to expand his fruit and vegetable production, McArdle's new Kubota tractor will be used for chores such as adding compost to beds, and to ultimately install and remove posts to prepare for more beds. His supporting dealer is Alex Power Equipment in Alexandria, Minn.
Northern Division: Christopher Banco, U.S. Navy veteran who rose to the rank of Petty Officer 2nd Class, is the owner of Marek Farms in Prosperity, Pa. He is reviving his family farm after 40 years, and currently grows vegetables, eggs and poultry, managing it all by hand to sell to local farmers' markets. His new Kubota tractor will help with his plans to plant five acres of blueberries and 10 acres of mixed fruit trees, while revitalizing 75 acres of pasture and another 70 acres for woodland to continue to grow his pastured poultry operation. Banco also wants to open the farm to other veterans interested in farming. His supporting Kubota dealer is Murphy Family in Washington, Pa.
Southeast Division: Michael Reynolds is a U.S. Army veteran deployed multiple times to Western Asia and Iraq. After suffering a traumatic brain injury while deployed, he has endured years of rehabilitation to create a new normal after retirement. As the owner of Reynolds Cattle Ranch in Calhoun, Ga., Reynolds specializes in non-GMO beef and pork sales, while also growing field crops, fruits, lumber, livestock and vegetables on 82 acres of land. His goal for his new Kubota tractor is to increase the farm's independent sustainability to 85 percent, work toward self-reliance and build several barns. Long term, Michael is interested in establishing a non-profit organization to provide sustainable agriculture and cooking lessons to disadvantaged youth and veterans. His servicing dealer is Rhinehart Equipment in Rome, Ga.
Kubota's philanthropic mission is to "power and empower those who move the earth," and in that spirit, "Geared to Give" was born in partnership with FVC in 2015. To build on the program and extend its benefits to even more veterans, the company recently announced a program enhancement in the form of instant customer rebates on Kubota equipment for all FVC members. "This program empowers farmer veterans to achieve their dreams," said Alex Woods, Kubota vice president of sales operations, supply chain and parts. "We are pleased to have selected these five very worthy veterans for this year's awards. It is an honor to work with each of them and the dealers who support them. We encourage more veterans to visit their local Kubota dealerships, meet their dealer and learn more about the program, and how Kubota products can help them bring their farming operations to the next level." Michael O'Gorman, executive director of FVC, said, "When I meet with veterans whose lives are positively impacted by the work of the Fellowship Fund, I see firsthand what having the right tools can do to enrich their farming operations. And, there truly is no greater gift for a farmer just starting out than a tractor. We are proud to continue the important work with Kubota's help of reaching veterans in farming communities across the country." In addition, Firebird Products, a Kubota supplier for aftermarket accessories, donated Kubota-orange canopies for each tractor, which will help shield the operators from the elements. "We are proud to support our veterans," said Brad Curd, owner of Firebird Products. "We are thankful for our partnership with Kubota, a company that enables us to support giving back to farmer veterans in this way." Each year, farmer veterans can apply to the FVC Fellowship Fund in order to be considered for donated Kubota equipment through the "Geared to Give" program. For more information on FVC's 2019 application process, visit www.farmvetco.org. For more information on the "Geared to Give" program, visit www.kubotacares.com.